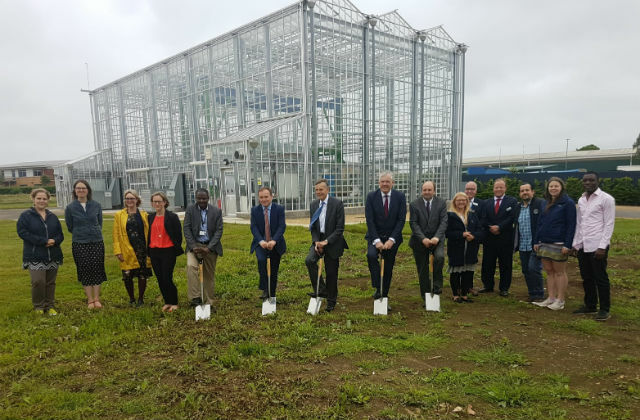 On today's blog we look at World Environment Day, Minister Eustice's visit to Cranfield University and cross party support for the Ivory Bill during its second reading in Parliament. Today marks the UN’s World Environment Day, an annual event to raise awareness globally of the need to protect our environment. This year, everyone is being encouraged to #BeatPlasticPollution and think about how they can reduce the plastic they use in their everyday lives – the central message being, if you can’t reuse it, refuse it. There has been widespread coverage of World Environment Day across broadcast bulletins this morning, with the Telegraph focusing on efforts by the campaign group A Plastic Planet, which is holding ‘One Plastic Free Day’ and urging everyone to boycott food and drink packaging for the next 24 hours. Plastic in our oceans is a global issue that requires international action. India is this year’s host country for World Environment Day, and around the world there are awareness-raising events, plastic pick-ups and beach-cleans taking place. In the UK, Sky Ocean Rescue is hosting a major ocean summit in Cardiff, coinciding with the Volvo Ocean Race. It’s great to see how enthusiastically campaigners, businesses, industry and the British public are embracing the move towards beating plastic pollution. In the UK we have already taken significant steps taken to tackle the scourge of plastic – introducing one of the world’s toughest bans on microbeads, taking nine billion bags out of circulation through our 5p plastic bag charge, setting out plans to ban plastic straws, stirrers and cotton buds and introducing a deposit return scheme, subject to consultation. You can check out the Environment Secretary’s message on World Environment Day in the video above. Plastic pollution is one of the most pressing environmental challenges of our time – and action is needed now. This World Environment Day I encourage everyone to think about how they can reduce the plastic they use. Today (Tuesday 5 June) Farming Minister George Eustice is at Cranfield University to mark the start of construction on a new £3.2 million agri-informatics facility, which will be the home of the National Reference Centre for Soils and the LandIS system (a national database which stores soil and related land information). The new facility, which is due to be completed in 2019, will underpin and support Defra’s goals announced in our ’25-Year Environment Plan’, providing the basis for achieving sustainable soil management by 2030. Protecting and nurturing our nation’s soils is a cornerstone of our future farming policy. This new agri-informatics facility will help us develop the science, research and innovation that we need in this area, combined with the lessons that have been passed down through generations. As we work towards delivering our ambitious 25 Year Environment Plan, I look forward to continuing our essential work with Cranfield University. Last night MPs debated the Ivory Bill in Parliament (04 June) and the legislation progressed through its Second Reading, bringing one of the world’s toughest ivory sales bans a step closer to becoming law. The Bill, introduced by Environment Secretary Michael Gove in May, will be the toughest in Europe and will help to protect elephants for future generations. It covers ivory items of all ages, not only those produced after a certain date, subject to some narrow, carefully-defined exemptions. The maximum penalty for breaching the ban will be an unlimited fine or up to five years in jail. MPs from all sides of the House gave their support to the Bill during the debate in the House of Commons. Today there has been follow-up coverage on ITV News and in Antiques Trade Gazette. It would be impossible for any of us to face our children and grandchildren and to say that we had the opportunity to take the steps legislative and otherwise to safeguard this magnificent creature and we failed to act. The legislation which is before the House today is an opportunity for us in the United Kingdom to play a part and to show leadership. 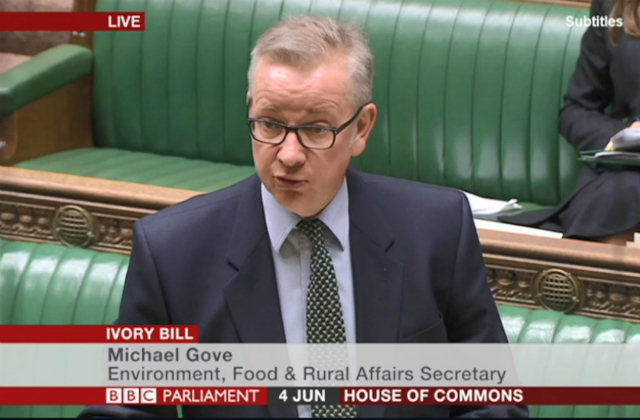 MPs wanted to ensure the ban did not put pressure from poachers on other species and the Environment Secretary reassured the House of Commons that there would be further opportunities to look at the scope of the bill in relation to other ivory bearing animals. There are forces within African nations that can see in the ivory trade an opportunity to make money, to feed organised crime and to support terrorist and other activity, and it is precisely because ivory poaching and the illegal wildlife trade sustain organised crime and subsidise terror that it is in the interests of all of us who not only want to protect nature and biodiversity, but want to see human societies and other states flourish, to take action to stamp out this crime, and that is what this Bill seeks to do. [Global leaders] will be able to look at what we are doing, and we will be able to demonstrate to others that we mean what we say on ending the trade in ivory. “We hope that other nations will follow our lead by helping to close down their own domestic markets, and that this Bill will inspire them to do so. The transcript of the debate can be read on Hansard and the debate can be watched on Parliamentlive.tv.